A New Moon Race? China Might Win It. Huzzah! The Chinese have just successfully landed a rover on the surface of the Moon. The landing marks the first so-called “soft landing” in four decades. The last one was by the USSR in 1976. It also marks China’s definitive status as the #3 space power in human history, and –dare I suggest it– the #1 contender for a promising deep-space human presence. 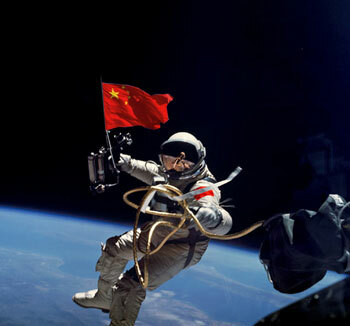 Let’s not forget that China in 2003 became the third country to independently put people into space. Quick history lesson…. the USSR put the first object and human into space and into orbit, and pretty much invented the longterm space living experience. The USA was always a very close second place, but miraculously pulled past the Soviets in the late 60s. By winning the Moon race in 1969, he USA solidified its status as the premier space power in the world. However, political and economic changes in the 1970s, 80s, and 90s saw the withdrawal of both the Russians and Americans from long term deep-space human mission planning. Many, myself among them, would characterize the retirement of the space shuttle in favour of the upcoming Orion system as a step backwards, in terms of both technology and vision. NASA has been increasingly transferring LEO (low Earth orbit) responsibilities to private companies. While both premier powers have made remarkable strides in deep-space robotic exploration, deep-space human exploration has not been seen as a governmental priority. Despite a lengthy absence, the US government revisited the idea of a lunar base back in the Bush II era, proposing the building of a permanent base near the Shackleton crater in the 2020s. The Japanese, despite having no indigenous manned space program, proposed their own base in the same timeline. The Russians are also toying with the idea. Even the Indians appear to be interested. Everyone is thinking about a Moon base. I’ve talked about all of this before, in this blog post. But what’s different now is that the Chinese have successfully made their first move toward their stated goal. Their more sober timeline suggests a manned landing in the 2030s, followed thereafter by some sort of permanent residence. So what? There are three things I want to point out…. The first is that there actually exists a UN treaty which stipulates that, much like Antarctica, the Moon cannot be claimed by any Earthly nation. And yet much of the discourse surrounding the Moon base plans has to do with territorial grabs. There’s no denying that there are resources aplenty Moonside, as well as the potential to establish valuable bases for low gravity manufacturing, asteroid capture, and as a waystation for deeper space voyages. So will the Chinese arrival on the Moon kickstart a new space race for the colonization of the lunar surface, for commercial purposes? And if so, will the UN treaty be honoured? We should be paying very close attention to how the Powers respond to new countries’ arrival on the Moon. There is nothing preventing the ESA (Europeans) from considering their own endeavour, or even nations whose technocracies might emerge in coming decades (such as several African nations of note). More ominous were the bitter comments coming from US websites (which I will not link to). They are of the “Well we did this in 1966, so what’s the big deal?” variety. Well it *is* a big deal. To lightly place a complicated robot on the surface of another world is an astounding technological achievement. It’s only been done by three nations. Let’s not forget that the American lunar program leveraged expertise from dozens of other countries, including Canada, Australia, Britain, and especially Germany. For the Chinese to have reached this position when they did is an economic and technical triumph, given that 70 years ago they were a war-ravaged nation; and 20 years ago they were still considered by many to be a “Third World” nation. Another important consideration is that history will look back and see very little difference between 1966 and 2013. Don’t believe me? The TV show, The Deadliest Warrior just examined a hypothetical showdown between Joan of Arc and William the Conqueror, two representatives of Medieval siege warriors. But those two warriors actually lived centuries apart. I doubt many American (or Canadian) school kids could confidently tell you which had lived first. Let’s not forget that while the Spanish beat the rest of Europe to the New World by decades, it was the English who eventually won the biggest prizes. Getting somewhere first isn’t as important as getting there with a good plan for long term exploitation. Similarly, we are still in the age of lunar pioneering. It’s still very much anyone’s game. The Chinese are 40 years late to the process, but they won’t be the last. Something tells me they are likely to be the “winners”, however, inasmuch as “winning” suggests a permanent presence with long term economic and political vision. The final point I’d like to make concerns the manner in which the emergence of BRIC nations onto the space frontier has been characterized in Western media. The economics of aid are a problematic science. The interior of China is still under-developed, with a great deal of poverty and human suffering, while the Eastern cities are almost 22nd century in their wealth and technological advancement. China is a regional military superpower with dramatic financial investments in Africa, the USA, the Caribbean and elsewhere. In recent years, they have been the fastest growing economy in the world, with a very strong financial base centred about the stable manufacturing sector. Yet they still host NGOs doing development work. India is similarly schizophrenic. A nuclear power that ha just launched a probe to Mars, and who is home to more billionaires than most European countries, India is yet undeniably a developing country with staggering poverty and millions of suffering people. So how do these two nations justify their expenditures on space programs when they have such pressing needs at home? This is the topic of the Economist article, How Can Poor Countries Afford Space Programmes? It’s a valid question with a complicated answer and hint of both racism and hypocrisy. One answer is that failure to invest in social supports frees a nation to make grand expenditures. It can be argued, for example, that the international NGOs providing HIV testing in Indian slums free the Indian government from having to pay for such testing. Similarly, the innate classism of these societies prevent them from seeing the uplifting of the poor as being of as great a priority as technological dominance. Another answer is that investments in nuclear power, military technology, and space programs are actually investments in economic infrastructure and, indirectly, human resources. Those programs in India, China, and the USA are tremendous wealth generators, and serve as standards for educational systems. Failure for a large country to make these investments, it can be argued, dooms those countries to lag behind the global economic crest indefinitely. And a third answer is that some base participation in the space sector is now mandatory for any people that does not want to languish at the bottom of the world’s wealth heap. Nigeria owns satellites, for example. Access to space is vital for telecommunications, weather data, and all sorts of other immediate and valuable applications. The argument goes that we are at a tender point in space history wherein the frontier is up for grabs, and that those who fail to capitalize will just have to pay a dramatically greater cost for the same, essential access a couple of generations later. As both a development scholar and space aficionado, my position is fairly simple: basic investments in people’s needs are actually quite inexpensive. So is a basic space program, at least as compared to a modern military program. Any two nuclear tipped missiles or an aircraft carrier pays for an ambitious space mission. Neither India nor China needs to be a regional superpower. But they do need to develop healthy space programs, as the economy of the late 21st century will depend in large part on space services. In other words, it’s possible to do it all.